I finally got some baking time in on Saturday and the results were amazing! Minus shredding the carrots, everything about this recipe was pretty quick and easy. So, here you go, the recipe for my new favorite muffin from Heirloom Baking with the Brass Sisters. Set the oven rack in the middle position. Preheat to 350F. Coat the cups and top surface of a 12-cup muffin pan with vegetable spray. 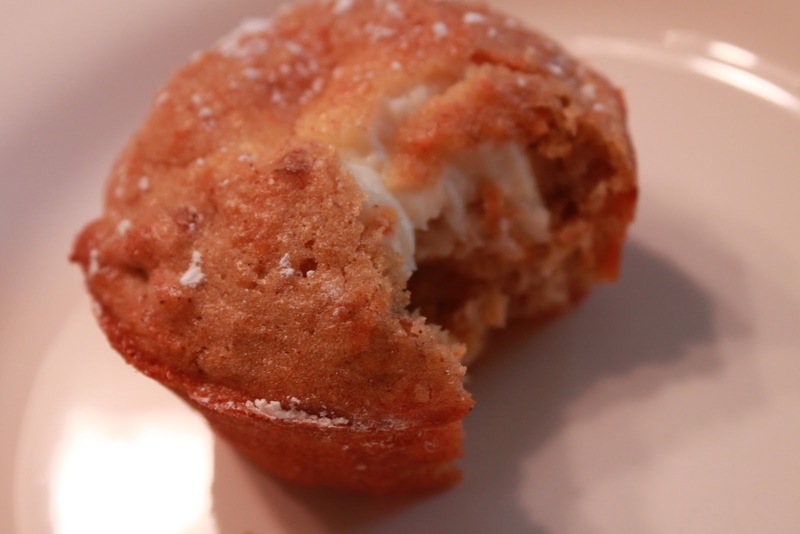 To make filling: Combine cream cheese and sugar in a small bowl with a fork until well blended. Cover with plastic wrap and freeze for 10 minutes. To make muffins: Sift together flour, salt, baking powder, and cinnamon. Cream butter and brown sugar in the bowl of a standing mixer with the paddle attachment. With the mixer running, add eggs, one at a time. Add orange extract, orange juice, and orange zest. Add sifted dry ingredients and mix well. Fold in carrots, raisins, and walnuts. Place 2 tablespoons batter in each muffin cup. Add a generous tablespoon of filling to each cup. Add remaining batter until each cup is full. Spread and smooth batter with the back of a spoon until filling is completely covered. Bake 20-22 minutes, or until a tester inserted in middle comes out clean. Cool on wire rack at least 20 minutes. Use the tip of a knife and your fingers to remove muffins from pan. Oh, those look wonderful. Nicely done.